Nacogdoches, Texas Affordable Dentures offers several styles of full dentures, each with special features and advantages. It’s part of our mission to put transformation within reach. See below for more details, or call us at 936-225-5445 if you have a question about a particular style. 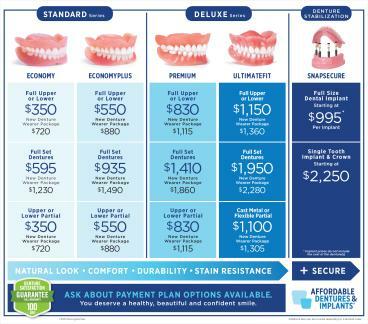 Affordable Dentures® in Nacogdoches, TX, has the solution when you're looking for custom dentures and implants at great prices. At our location, we're dedicated to carrying on a tradition of continued innovation in affordability, speed, accessibility, and patient satisfaction. We're America's largest denture provider, and we'll give you a good reason to smile. Our practice is conveniently located on North Street in the Northview Plaza Shopping Center. Since opening our doors, we've served thousands of people in the local community. Patients travel from as far away as Lufkin, Rusk, Crockett, Center, Jasper and the surrounding areas just to experience the advantage of our same-day service, and personalized tooth replacement options. When you come to the Affordable Dentures office in Nacogdoches, our experienced staff will help you find the best possible match for your needs. We craft dentures in our own state-of-the-art lab in order to provide our patients with a custom fit, and most of our services are available the same day. Contact us to learn more and to find out if you're a candidate for our services. Each Affordable Dentures location is independently owned and operated by a licensed general dentist. Our practice owner, Troy Simmons, DDS, FICOI, FAAIP, is proud to bring our services to patients like you who are looking for compassionate care that's given with dignity and respect. Dr. Simmons is a graduate of Ohio State University School of Dentistry, and he's supported by a well-trained staff of professionals. Our office is outfitted for patient comfort, and we'll always treat you right. Please fill out the form below to request an appointment. For immediate assistance, please call us at 936-225-5445.